Head coach Kliff Kingsbury of the Texas Tech Red Raiders reacts on the sidelines during the first half of the college football game against the Arizona State Sun Devils at Sun Devil Stadium on September 10, 2015 in Tempe, Arizona. The former Texas Tech head football coach turned USC offensive coordinator is known for his high-powered offenses and the Cardinals had the worst offense in the NFL last season. Kliff Kingsbury will take over as head coach of the Arizona Cardinals, the team announced Tuesday. The news comes just over a week after the team fired Steve Wilks following a disappointing finish in Wilks' first year. The Cardinals expect to introduce Kingsbury as head coach Wednesday at the team's Tempe facility. Reports began surfacing Monday that there was mutual interest between the Cardinals and the former Texas Tech head coach turned University of Southern California offensive coordinator. The 39-year-old Kingsbury was fired in November after a losing season at Texas Tech. He quickly took an opportunity with USC as an offensive coordinator. 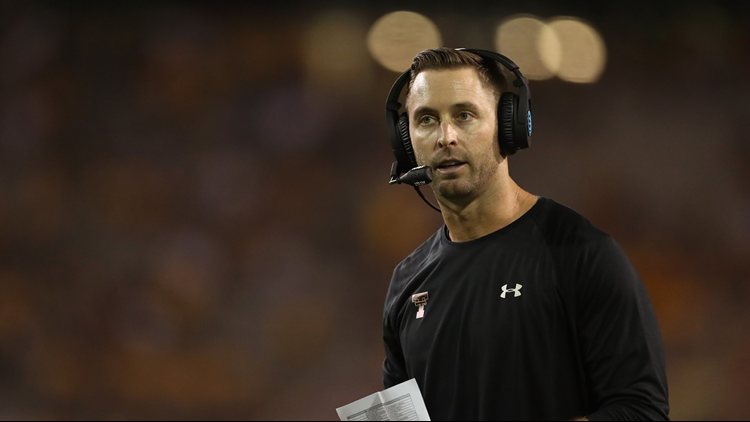 Once the NFL season ended, Kingsbury's name started popping up for potential job openings in the NFL, including offensive coordinator spots and even head coach positions. But, USC was denying those teams permission to interview Kingsbury in an attempt to hold on to their new offensive mind. Kingsbury coached the last six seasons at Texas Tech, leading the Red Raiders to winning seasons just twice. Prior to Texas Tech, he was the offensive coordinator and quarterbacks coach at Texas A&M and Houston. Kingsbury was a quarterback himself at Texas Tech from 1988-1992 and played three seasons in the NFL, including one with the New England Patriots in 2003 when he served as Tom Brady's backup. He's known for his high-powered offenses. Since he became an offensive coordinator in 2011, his offenses have scored more than 40 points per game while averaging almost 550 yards per game. The Cardinals had the worst offense in the NFL last season, finishing dead last in nearly every category including points per game, yards per game, first downs per game and so on. He also gets credit for developing Kansas City Chiefs quarterback Patrick Mahomes, who played three seasons under Kingsbury in Lubbock. Mahomes is now a favorite to win the NFL MVP award in his first year as a starter. Kingsbury comes into Arizona with the opportunity to coach up a young quarterback in Josh Rosen and try to work his magic to reinvent a stagnant offense.